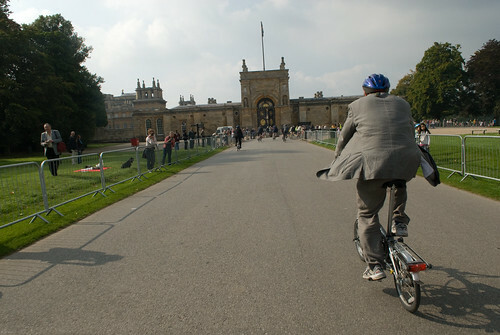 This weekend the Brompton World Championships were held at Blenheim Palace in Oxfordshire, England. 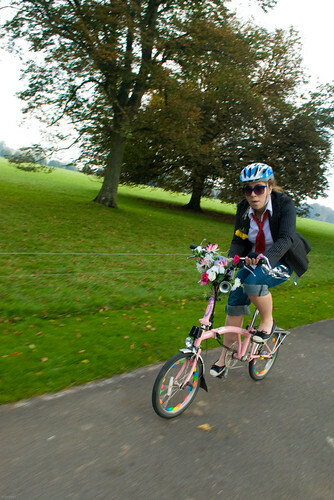 A Brompton is a folding bicycle made in London and is considered by many to be the best of its kind. It’s of very high quality and folds smaller than other bikes with the same wheel size, making it a very useful bike for urban riding and international travel. It’s so easy to fold it up and take it on a bus, train, taxi, or airplane. 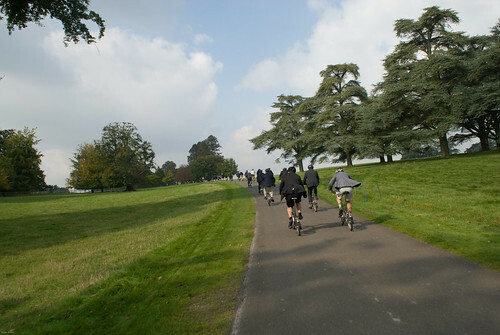 I should also mention that it’s a lot of fun to ride too! 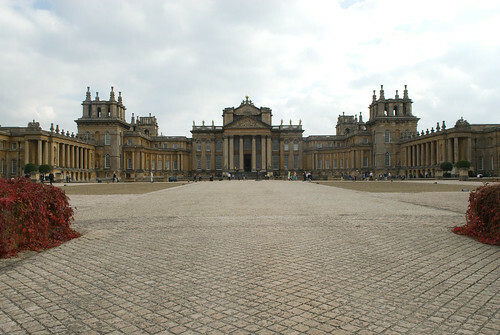 I have been riding a Brompton for four years now and often take it with me on trips within the UK as well as abroad. For the complete post with photos click here. 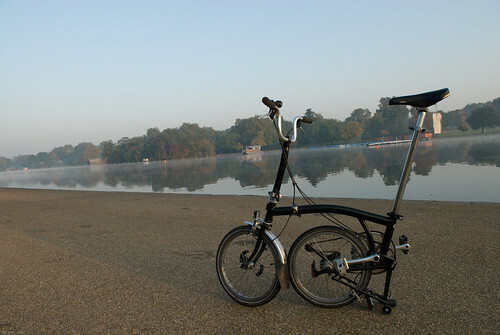 This first photo is of my trusty two-speeder and was taken at the Serpentine in London’s Hyde Park while I was on my way to meet the busses which took us out to Blenheim Palace. 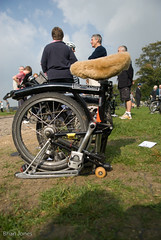 This next photo is of a Brompton that has been folded up. 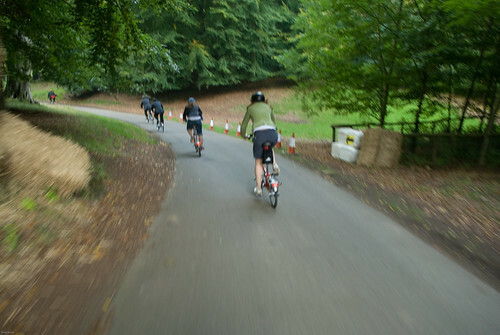 On Saturday, Brompton organised a casual ride out to their bicycle factory in Brentford. 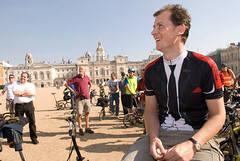 This is Will (the managing director of Brompton) wearing the official world championship jersey at Horse Guards Parade in London. 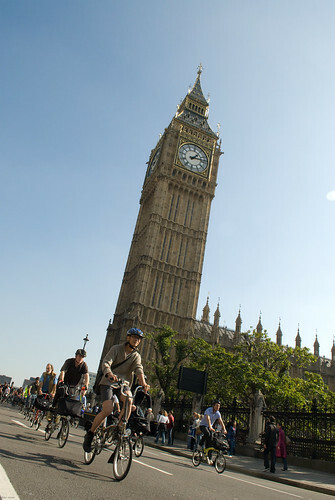 On the way out to the factory we passed by several famous London landmarks. Unfortunately my batteries ran out before we made it to the factory – but one of the other photographers who was there, Marcus Jackson-Baker, has kindly let me use his photos here. 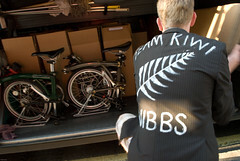 In the first one we see one of the mechanics assembling a Brompton. 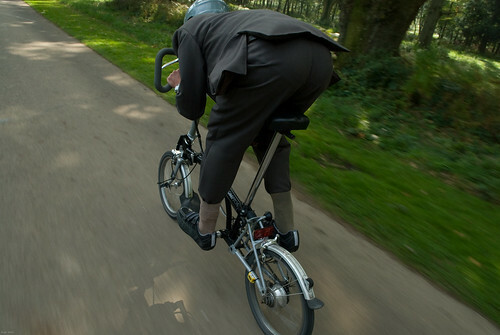 Each Brompton is assembled by one person and this particular worker can assemble 22 bicycles in a single day. 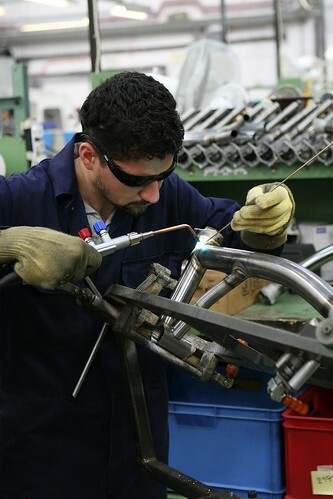 And in this one we see one of the workers brazing the frame together. 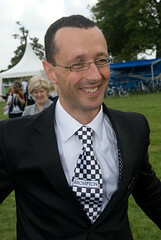 On Sunday morning Brompton organised two coaches to take us out to Oxfordshire for the Brompton World Championship race. 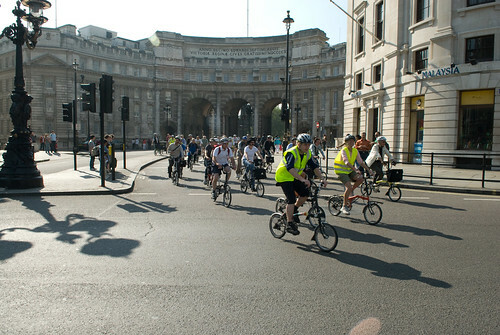 About a hundred of us met at Victoria coach station at 8am. 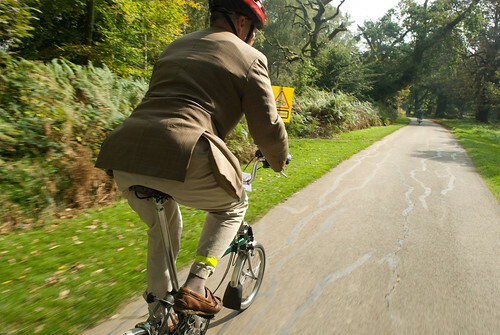 Who would have thought that you could fit 50 bicycles in one bus: with Bromptons you can! 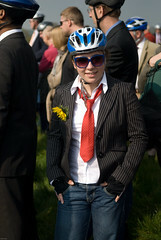 All participants, both male and female, must wear a suit jacket, collared shirt and tie. 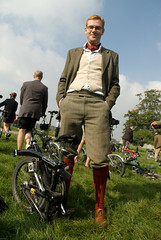 Shorts and three-quarter length trousers may be worn if preferred, though sports attire (e.g. Lycra shorts/leggings, tracksuit pants, etc.) is not permitted. 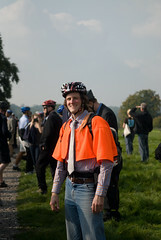 Here is a selection of shots of participants in their chosen outfits. I placed 171st in this year’s race. 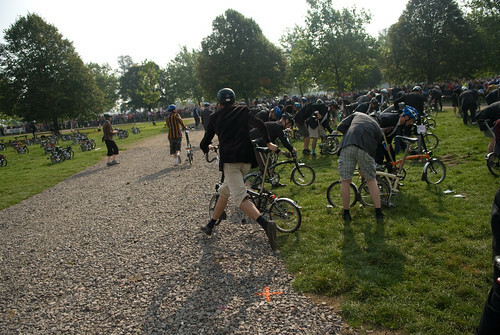 I think I could have done better if I hadn’t been photographing from my bike during the race. I never did stop, mind you! My goal is to jump 100 places in next year’s race (time to start training!). 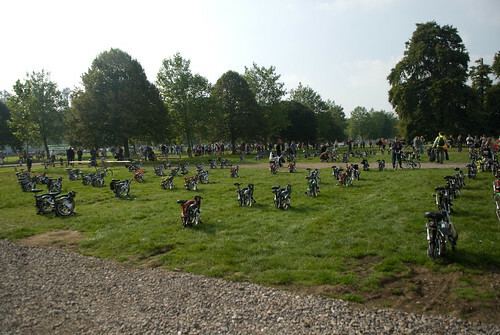 These are all the bikes waiting to be unfolded by their respective riders at the start of the race. 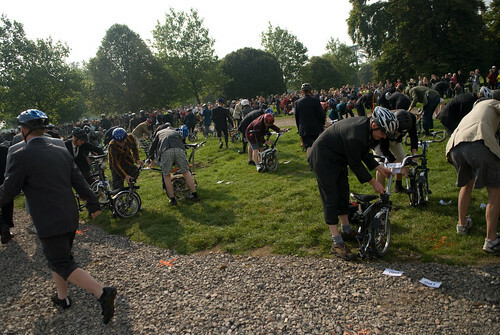 Here are the riders crossing the start line on their way to unfold their bikes. 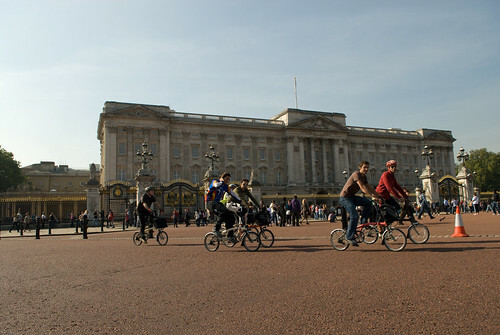 Here they are unfolding their bikes.
. . . towards the palace . . .
. . . then up the hill . . .
. . . then down the hill . . .
. . . then up another hill. The winning Spanish team speed by . 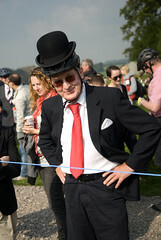 . .
And a few shots of the other competitors. 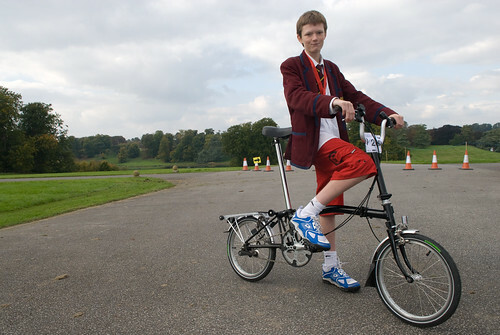 This is Piers Benton, winner of the junior category. And here are my new friends from Curbside Cycles in Toronto, as we did one last lap before catching the coach back to London. Click here to see a photoset of all my 80 favourite photos. 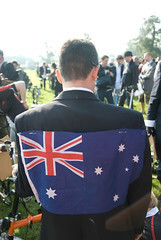 Follow this link to see a photoset of the rest of the photos from the weekend. 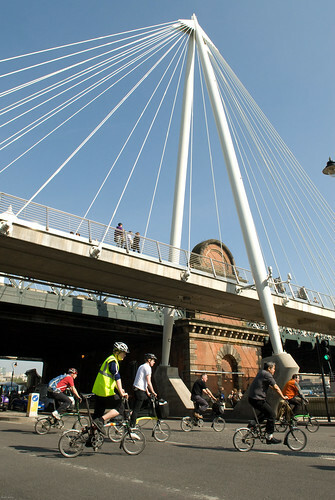 I feel these photos are good but not my best work – but I have put them up so my new Brompton friends can see pix of themselves. 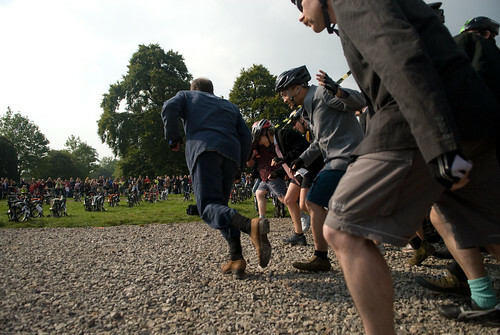 Visit the Brompton website to see the all the results from the race. 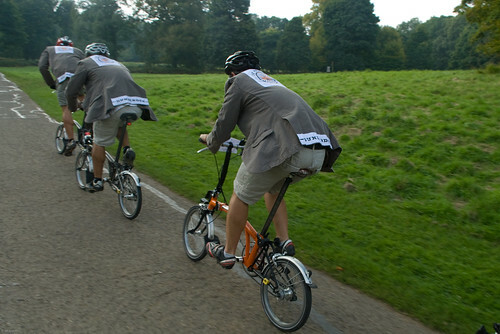 To find a Brompton dealer near you visit the Brompton website. 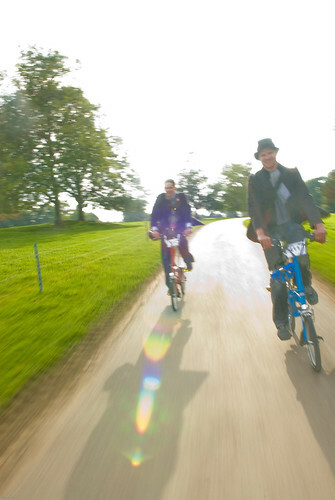 To see more of Marcus Jackson-Baker’s photos from the factory day go here and follow this link to read Marcus’s blog post about the Brompton World Championship weekend.